Master Caution and System Annunciator lights, left and right. 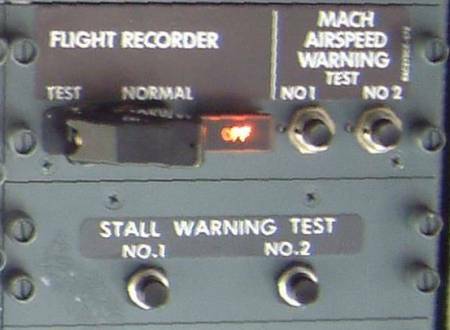 The Master Caution system was developed for the 737 to ease pilot workload as it was the first Boeing airliner to be produced without a flight engineer. In simple terms it is an attention getter that also directs the pilot toward the problem area concerned. 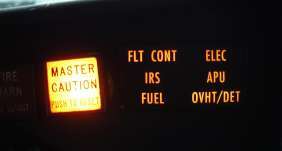 The system annunciators (shown above) are arranged such that the cautions are in the same orientation as the overhead panel e.g. FUEL bottom left, DOORS bottom of third column, etc. Pressing the system annunciator will show any previously cancelled or single channel cautions. If a single channel caution is encountered, the QRH drill should not be actioned. Master caution lights and the system annunciator are powered from the battery bus and will illuminate when an amber caution light illuminates. Exceptions to this include a single centre fuel tank LOW PRESSURE light (requires both), REVERSER lights (requires 12 seconds) and INSTR SWITCH (inside normal FoV). When conducting a light test, during which the system will be inhibited, both bulbs of each caution light should be carefully checked. The caution lights are keyed to prevent them from being replaced incorrectly, but may be interchanged with others of the same caption. Red lights - Warning - indicate a critical condition and require immediate action. Amber lights - Caution - require timely corrective action. 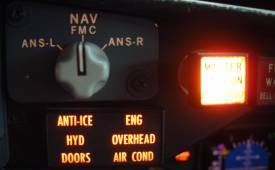 Blue lights - Advisory - eg valve positions and unless bright blue, ie a valve/switch disagreement, do not require crew action. Green lights - Satisfactory - indicate a satisfactory or ON condition. 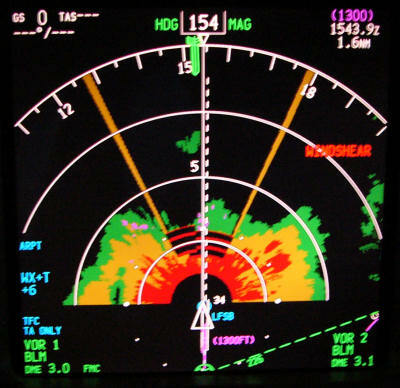 To test the GPWS, ensure that the weather radar is on in TEST mode and displayed on the EHSI. Pressing SYS TEST quickly will give a short confidence test, pressing for 10 seconds will give a full vocabulary test. 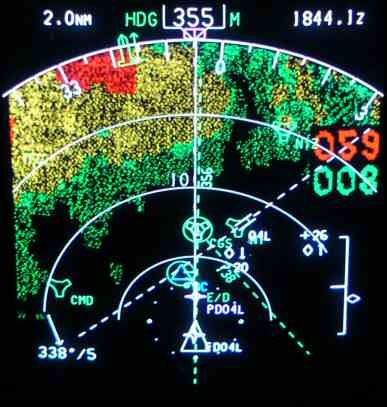 2500 ("Twenty Five Hundred" or "Radio Altimeter"). Customers can also request special heights, such as 60ft. If is often commented how loud these callouts are. The volume level for these callouts and any other aural warnings is set so that they can still be audible at the highest ambient noise levels, this is considered to be when the aircraft is at Vmo (340kts) at 10,000ft. The design sound pressure level at 35,000ft, M0.74, cruise thrust is 87dB at the Captains seat, compared to 90-93dB in the cabin. "Using the flight deck noise levels measured by Boeing Noise Engineering during a typical flight profile (entire flight), a daily A-weighted sound exposure was calculated using ISO/DIS 1999 standards. This calculation indicates the time weight noise exposure is below 80 db(A) and should not cause hearing damage. Flight deck noise improvement continues to be a part of current Boeing product quality improvement activities." "Boeing has conducted extensive flight tests to define the contributing noise sources for the 737 Flight Deck. Subsequently, various system and hardware modifications have been evaluated for possible improvements. Currently there are no proposed changes where the benefits are significant enough to warrant incorporation. Additional candidates are currently under study and if their merit is validated, they could be incorporated at a later date during production and retrofit." That said, in 2005 Boeing added 10 small vortex generators at the base of the windscreen which reduce flightdeck aerodynamic noise by 3dB. (See fuselage page for photo). Stall warning test requires AC power. Also, with no hydraulic pressure, the leading edge flaps may droop enough to cause an asymmetry signal, resulting in a failure of the stall warning system test. If this happens, switch the "B" system electric pump ON to fully retract all flaps and then repeat the test. The OFF light may indicate either a failure of the heater of the angle of attack sensor a system signal failure or a power failure. The test disc should rotate, indicating electrical continuity, when the switch is held to the test position. TCAS is now integrated at production into the EFIS displays. 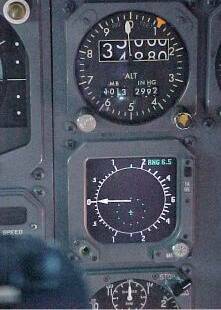 The PFD/EADI will display advisories to climb, descend, or stay level since they give the vertical cue to the pilot. The ND/EHSI provides the map view looking down to show targets and their relative altitude and vertical movement relative to your aircraft. TCAS control is from the transponder panel. 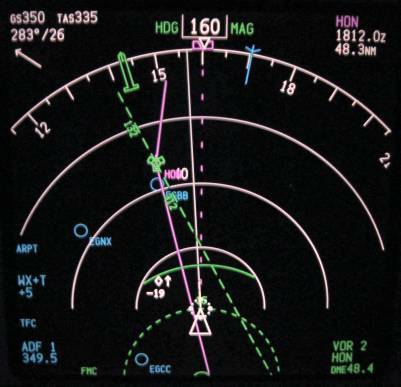 The beamwidth of the 737 weather radar is 3.5 degrees. eg Wx at range 40nm stops painting at +2deg tilt. The tops would be 40 x 0.5 x 100 = 2000ft above your level. 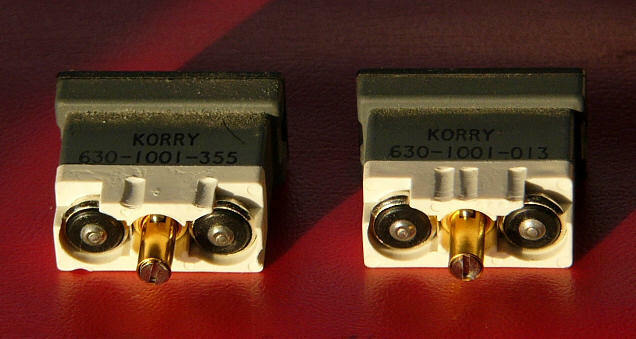 Weather radar or terrain can be overlaid onto the EHSI with these switches on the classics. 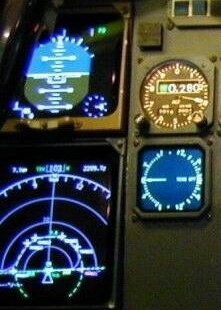 In the NG the overlay switches are part of the EFIS control panel. The colours may appear similar but their meanings are very different. 737 NG's are fitted with predictive windshear system (PWS). This is available below 2300ft. You do not need weather radar to be switched on for PWS to work, since it switches on automatically when take-off thrust is set. However there is a 12 sec warm up period, so if you want PWS available for the take-off you should switch the weather radar on when you line up. Windshear warning displayed on the ND. Notice the cone and range at which windshear is predicted. The two overlaid numbers are the highest and lowest terrain elevations, in hundreds of ft amsl, currently being displayed. Here 5900ft and 800ft amsl. One of the main difference between Peaks display and others is that it will show terrain more than 2000ft below your level (eg a mountain range from cruise altitude). This can be very useful for situational awareness. Do not use the terrain display for navigation. Do not use within 15nm of an airfield not in the terrain database. The Proximity Switch Electronic Unit (PSEU) is a system that communicates the position or state of system components eg flaps, gear, doors, etc to other systems. 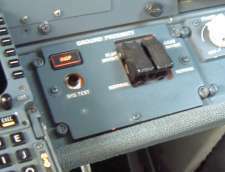 The 737-NG's are fitted with a PSEU which controls the following systems: Take-off and landing configuration warnings, landing gear transfer valve, landing gear position indicating and warning, air/ground relays, airstairs & door warnings and speedbrake deployed warning. The PSEU light is inhibited from when the thrust levers are set for take-off power (thrust lever angle beyond 53 degrees) until 30 seconds after landing. If the PSEU light illuminates, you have a "non-dispatchable fault" and the QRH says do not take-off. In this condition the PSEU light can only be extinguished by fixing the fault. However if you only get the PSEU light on recall, you have a "dispatchable fault" which it is acceptable to go with. In this condition the PSEU light will extinguish when master caution is reset. SFP aircraft (-800SFP / -900ER) also have an SPSEU which monitors the 2 position tailskid.